"A heart is not judged by how much you love, but by how much you are loved by others." Welcome to this week's instalment of My Week In Words. 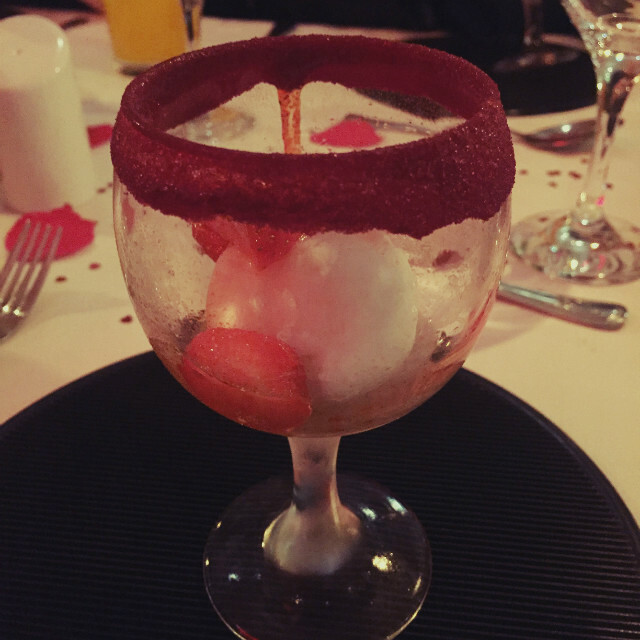 It was a great week, the beginning of a new blogging venture that I'm super excited about and a lovely family Valentine's dinner... that happened to be the day before Valentine's day. This post covers from Sunday 7th to Saturday 13th of February. Enjoy! I was up for my fry up as usual on Sunday. I ate and watched stuff on my phone. I've been really addicted to the DOLLASTC channel on YouTube lately. After breakfast I spent a lot of the day watching NHL games while writing My Week In Words. Admittedly, I wasted a bunch of time before actually doing any work. As such I didn't actually get it finished. I waited so long that by the time I made any headway my aunt Karen stopped by for her weekly visit. My dad and aunt had been visiting my granda in hospital and Eva had been at work so we decided to get pizza for dinner. We had a nice catch up while we ate. After I got some more work done but ended up heading to bed before I could get it finished. With Mum still in England visiting my granny, Eva had to get me out of bed before she went to work on Monday. She made breakfast and we watched still until she left. Once she was gone I started work on My Week In Words while I watched NHL games. 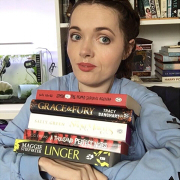 Eventually I got My Week In Words post, which you can check out here if you missed it. Later on I worked on editing photos, spending most of the day on my own while Eva and Dad were at work. Well, not completely on my own as my Labrador - Baby - decided to grace me with her presence. On Monday the Friendship Four's return in November was officially announced, including dates and what teams would be involved. I was a tiny bit disappointed that UMass Lowell weren't coming back to defend their title but still incredibly excited. 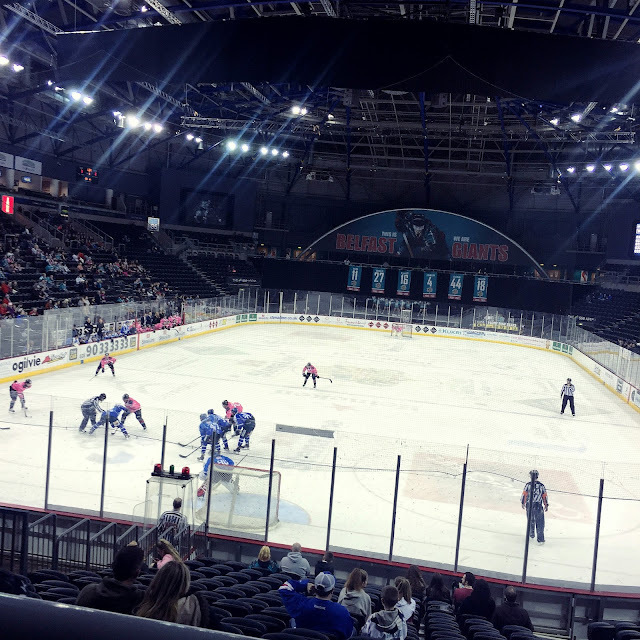 If you want to read my post about the Friendship Four 2015 ice hockey tournament you can check it out here. In the evening I took part in The Girl Gang chat and got a little distracted browsing Etsy. I ended up buying some more doll clothes. I really need to lay off splashing the cash, but if you read on you'll see things didn't get much better throughout the rest of the week. I also started using Snap Chat again on Monday. I kind of forgot how addictive it can be. If you want to follow me you can find me at BloonStuff. When Eva came in from work I chilled with her for a bit before heading to bed. It was Pancake Tuesday on... well, Tuesday. So Eva got me up and we made pancakes together. Which really means Eva did all the hard work and I took photos so I could write a blog post about it. Once they were ready we watched Good Mythical Morning while we ate. It was an awesome start to the day. 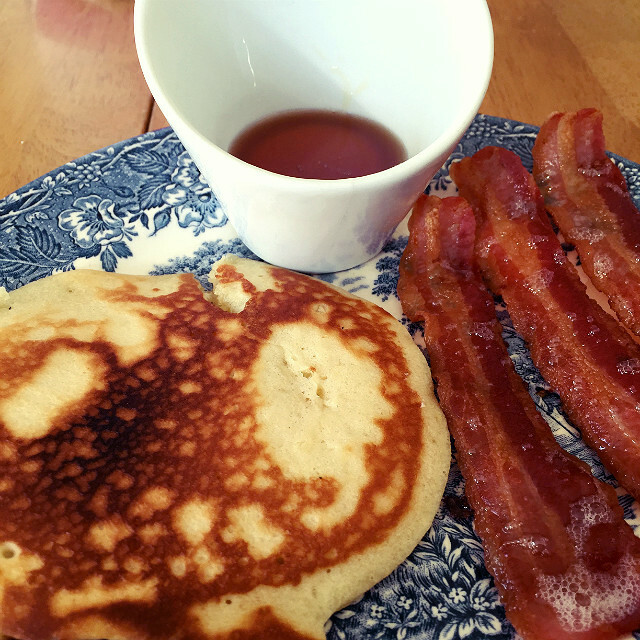 After breakfast I wrote my post about making pancakes, in which I divulged my sister's secret - not so secret - recipe and explained a bit about the reason behind the special pancake day. Sort of. If you missed it you can find it here. While I worked on my post Eva took Berty, her Chihuahua, to the vet. He's been reverse sneezing a lot lately. When she got back we both cleaned out our snails. I'm happy to say that so far the bugs haven't reappeared. Later on I worked on editing some photos and then I sorted out my Filofaxes. Back in August I had ordered two new Filofaxes and ended up only using one. I didn't feel so bad as one of their diaries didn't begin until 2016 but once we hit January I started to feel guilty that it was going to waste. 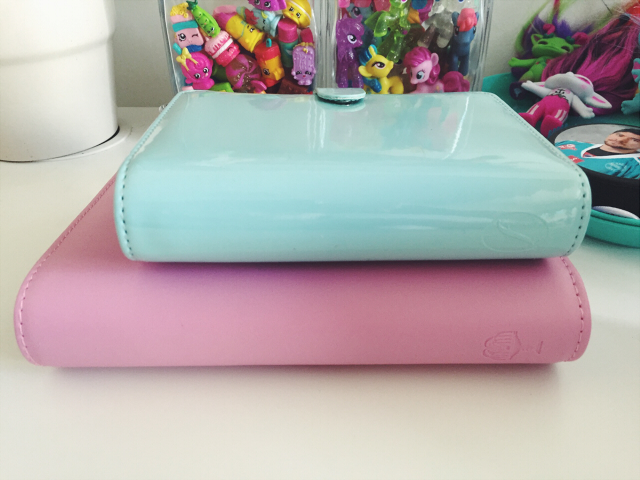 On Tuesday I finally decided to use the bigger one for My Week In Words notes and use the pocket Filofax that I had been using to keep memos in. Things like appointments, game days and keeping tract on what I order online etc. After sorting my Filofaxes I had dinner and then watched YouTube videos with Eva for a while. I got a headache and decided to clean out Rue on Wednesday instead of Tuesday as I'd planned. Eva and I decided to get into bed but rather than watching Degrassi - which we've almost finished - Eva decided to introduce me to Skins. We began with season five. I stayed in bed the rest of the evening. My mum had come home from England on Tuesday but Eva still ended up getting me out of bed on Wednesday. She also made me breakfast. 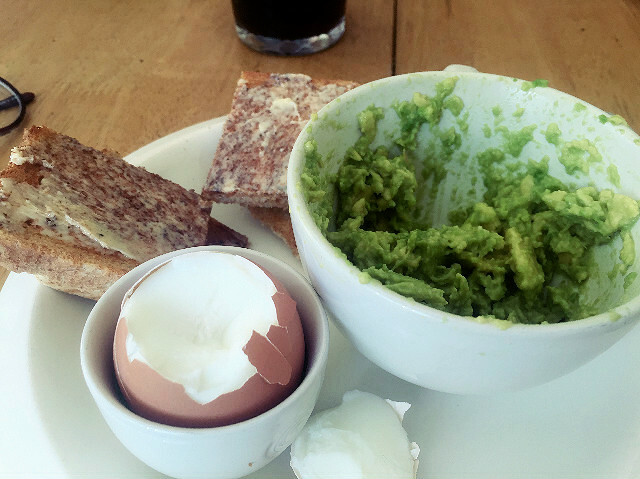 We had boiled egg, avocado and toast. One of my favourite breakfasts. We watched stuff on our phone while we ate and then after Eva brought in our laptops. I worked on a blog post while Eva worked on her nails and put on a RuPaul's Drag Race episode. The day marked a year since I started watching the show so we thought we'd celebrate by starting to re-watch season 5. The season I started with originally. On Wednesday I also had the idea to start a second blog for my toy related posts. A blog that I would keep appropriate for all ages. I decided to run a poll to see what people thought and most people seemed to say they thought it was a good idea and the ones that voted they didn't, didn't actually give me any reasons as to why so I decided to go with it. I ended up doing a little research into what I should call the blog and such. I've made a lot of headway since then and I'm really excited about this new blogging venture. I hope some of you will follow me over to that blog too if you've enjoyed my Toys 'n' Stuff series. Wednesday was a good day in relation to my anxiety too. I had a couple of phone calls I had to make and I was determined to do it myself. I rearranged a visit, made a doctor's appointment and made an appointment for my sister's dog to be groomed. Eva and I have come to an arrangement that I'll handle most of the phone calls and she'll handle speaking to people in public, like shop assistants etc. Sounds like a good compromise, right? I felt very accomplished after making the calls, especially because I wasn't shaking and nervous like I usually am. I also booked mine and Eva's stay in Belfast in November for the Friendship Four tournament. I figured I might as well to be sure we get a room, plus we don't have to pay until then and have the option of cancelling with no charge right up until 1pm the day of check in. So roll on November! In the evening I cleaned out Rue. It's always something that I don't look forward to but I actually enjoy it once I start. I think it's when I feel most productive. It's also a bit of a big job and while I do need some help it feels good to do it myself. I feel lucky that I'm able t do what I can myself. 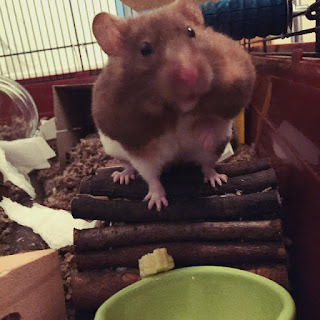 Anyway, as usual the cage looked more messy at the end than when I started and Rue had to go around tidying up the bedding and food I'd scattered for her. If you own a hamster I really recommend scatter feeding and scattering the bedding materials. It's just more entertaining for them. It's also kind of cute to watch too. I'm always surprised by how much she can fit in her little cheeks. I was pretty shattered by the time I finished cleaning out Rue, so I had supper. While I ate Eva and I started watching season 5 of Skins. I'd never really watched Skins, even though I was familiar with a lot of the characters. Eva wanted to introduce me to it and we both didn't want to finish Degrassi too soon, so I thought why not. After supper we got into bed and watched it until the early hours of the morning. Eva was off on Thursday so she got me up after Mum had left for work. She also made me breakfast and we watched YouTube videos while we ate. I spent a lot of the day just working on blog stuff. I set up a new domain for my new blog but I had a lot of trouble getting it to work. I hate that you can do something once and it work but then can't do it a second time. Later on in the the day we planned to go do a little shopping so I had to get a shower and get ready to go. Eva and I were both ready quie a while before my dad actually came home to take us. We were supposed to go around 5pm and be finished for Mum finishing work at 6:30pm but Dad didn't get home until closer to 6pm, so we were a little more rushed than we wanted to be. 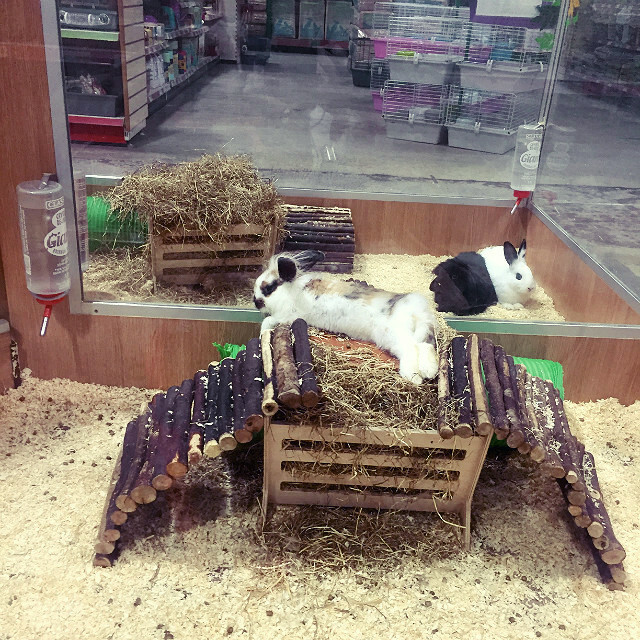 As usual we hit Pets At Home first. I got a photo of a bunny I had really liked the last time I was there but it had been under a bridge so I couldn't get a good photo. He or she would go just lovely with the whole accidentally colour theme of my pets I have going on. I also seen these sleeping beauties in the photo above. 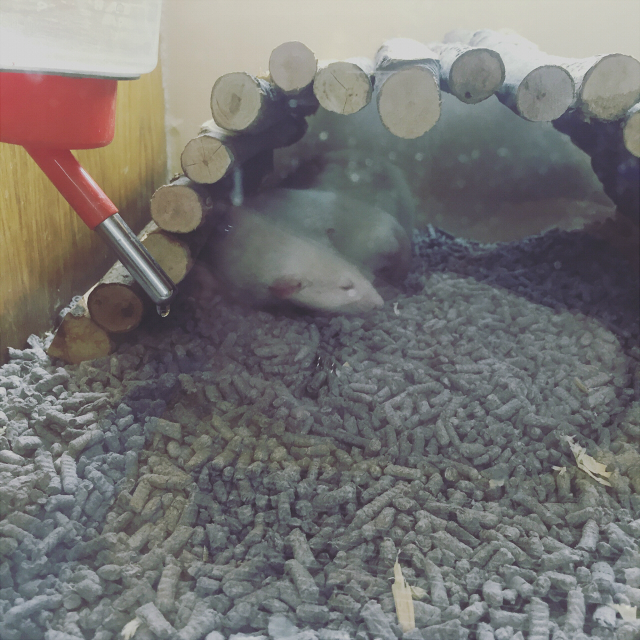 It's hard to tell here but their little ratty faces were smooshed up against the glass. 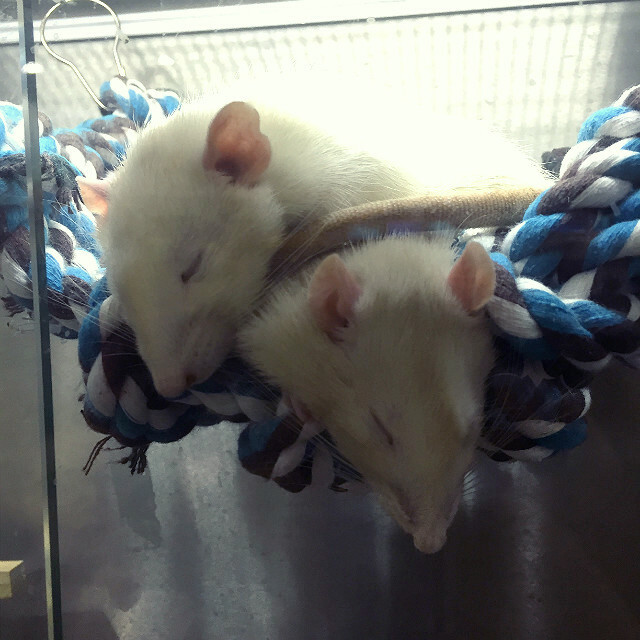 The hardest to resist out of all the animals I seen in the store was this pair of rats in the adoption section. It's hard to tell but I think it may be two male dumbos. They were just adorable. If it hadn't been for my parents I would no doubt have come home with them. It was very hard to leave them behind. I then went to Smyths and Tesco to see if there were any toys that caught my eye for future blog posts. To be honest, I'm probably just making a second blog as an excuse to buy toys even more often! Check me out with my big bag of fun. Eva and I also bought a Valentine's Meal Deal from Tesco for Valentine's day. Both being single we have more of a family Valentine thing going on. I like it. We didn't have time to eat in the food court so we got our food to go. 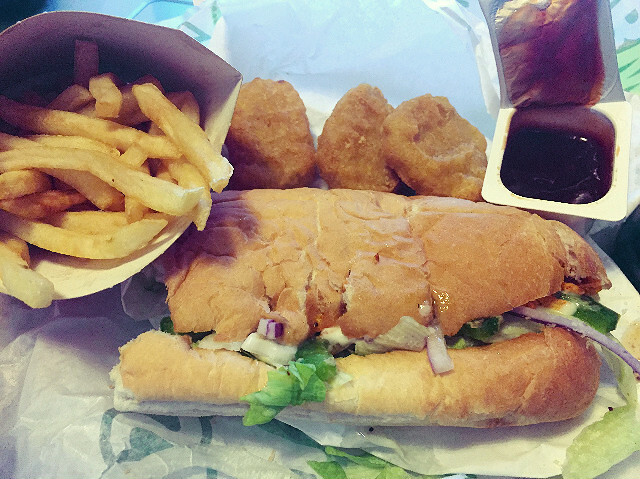 We ended up getting both Subway and some McDonald's on the side. Ah, what a meal. I wish I had it right now but I digress. I was completely stuffed after eating and it took me a little bit to recover. I did some more blog work, including making the social media accounts for my toy blog. The reason behind that is it's social media accounts will be family friendly, much like the blog. If you are interesting in checking out the accounts and following them, here are the links. (This blog was discontinued and related social media accounts deleted). I also made a YouTube channel but it will be a while before there's anything on it so I'll leave that out for now. I still have some design work to do for some of those accounts and most are a little empty at the moment but if you enjoy toys I would really appreciate the support if you followed them. Thanks! Dinner had really done me in so it wasn't long before I headed to bed to sleep off my food baby. My mum got me up on Friday before she and Eva went to work. I watched some YouTube with Eva while we ate breakfast before she left. Most of the day I spent by myself working on blog design. I was really chuffed how much I got done and I'm really happy with the look I've gone with. It's the same layout to this blog but more colourful. There's still some work to do but I made great progress I feel. I had toyed with the idea of missing the ice hockey game on Friday night as my dad would have to take me after work. He's had a lot on and I felt bad that he'd have to add that to the list. It wasn't a league game or anything, they were playing an Italian team in a friendly match. I wouldn't have minded missing it only I'd spent £30 on the tickets for the two games, one on Friday and one on Saturday. I figured I could miss the Friday one and perhaps my aunt Karen would take me on Saturday. However, my aunt had forgotten she'd agreed to take me and she didn't really seem keen on taking me either. I hate forcing people to take me but I also didn't want to outright waste £30. Also my parents were going to my dad's golf club on Saturday and had invited Eva and I but I'd said no because I was supposed to be going to the game. Dad ended up saying I would be better going on Friday with him if he felt up to it and missing Saturday's game and going for dinner instead. When Dad came home around 4pm he had a nap while I did my make up. As it was Valentine's weekend the team had special jerseys that were all being given away at the end of each match. On Friday they were pink with red hearts and on Saturday they were red with pink hearts. They were also selling Valentine's mugs the same as the shirts. I got myself and Eva one each. I was a little bummed they didn't have both colours on sale on Friday but Eva and I ended up both getting the pink one. Still, I think the pink was my favourite anyway. The game itself was pretty good. We had a bunch of our team missing as they were away playing for Team GB. It was a bit of a slow start and the away team scored first but towards the second half I thought things really picked up. We ended up winning 3-2... as far as I remember. Dad and I picked Eva up on he way home and as I'd skipped dinner we ate together when we got home. After chilling for a bit with Eva and telling her about the game, I went to bed. I also posted a blog about my Drag Race'versary on Friday. If you missed it you can check it out here. 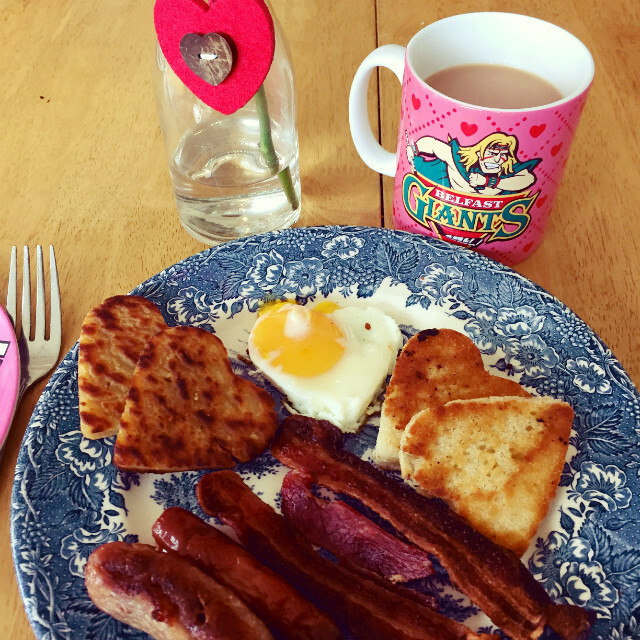 I woke up to this lovely Valentine's themed fry up on Saturday, complete with a brew in my Belfast Giants Valentine's mug. How cute? And it tasted darn good too. I'm not really sure why my parents decided to do this on the 13th but I wasn't complaining. After I let my breakfast go down I got to work on some blog work. I say work but it was actually opening toys and taking photographs, so I use he term work really loosely. After working on blog stuff and taking a shower I eventually started getting ready for our 8pm dinner reservation. I was glad I didn't feel anxious about missing the ice hockey game. We had a little bit of a hiccup before we left and I almost ended up in tears. I can thank my imminent period to thank for that. My dad always gets stressed when we're going to his golf club and he ended up snapping at me. Thankfully everything was smoothed over by the time we got there. We got drinks (cola) in the bar before we were taken through to the restaurant. I had a bit of a anxiety spike when I headed into the crowded restaurant and found there was live music and we were right by the stage. 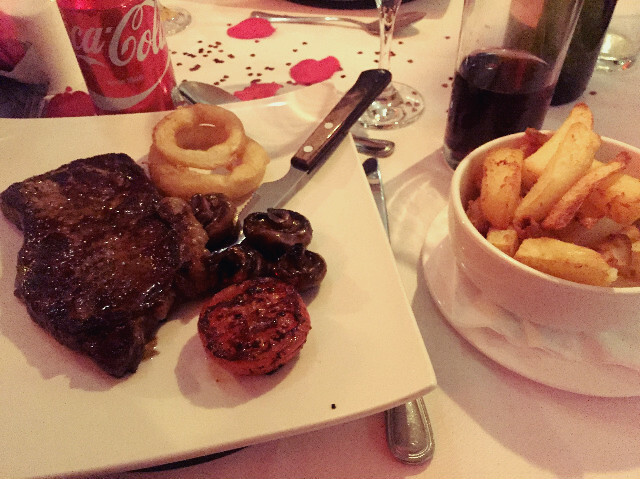 I was also bummed out to find that what I was gong to order was no longer available, so I had to order steak which also added to my anxiety as I find steak hard to swallow at times. Still, I tried to keep a handle on things. 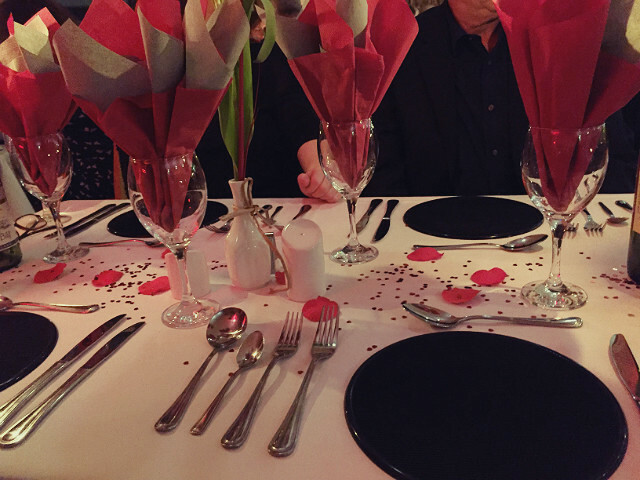 The restaurant was all Valentine's themed and the tables were decorated lovely. 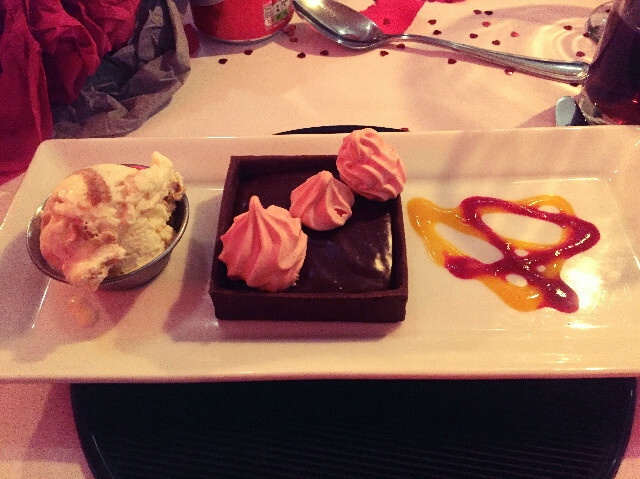 The meal was five courses and the food tasted beautiful. My steak was so tender even though it was well done, the way I like it. I also really loved my parfait starter. Apologies that the photos aren't great, the lighting was very dim. It turned out a lovely family Valentine's dinner. There was a great atmosphere, even if the live singer was a bit cringe. Apparently he didn't realise it was a sit down dinner type fare and he was more used to something a little more 'pumping' so it threw him off his game. By the end of the night I was full up and shattered and I was looking forward to getting home and to bed. After tinkering a little more on my blog when I got home that's exactly what I did.